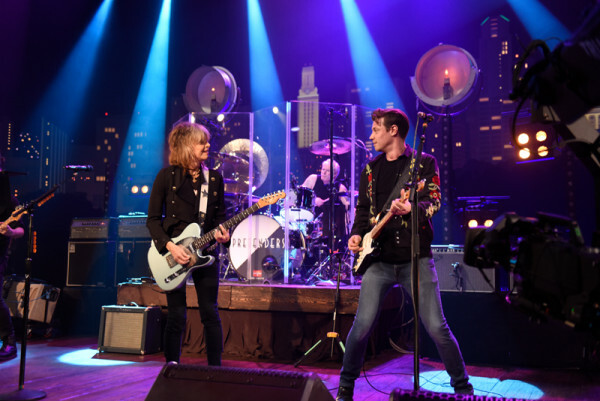 Austin City Limits Season 43 rocks on with a hit-filled hour starring the great Pretenders in their first-ever appearance on the ACL stage. The legendary rock band sends a message of love to viewers with an eleven-song hit parade. Influential punk new-wave veterans the Pretenders are in fighting form as they kick off an electrifying hour with new classic “Alone,” a swagger-fueled gem that fits right into the band’s canon, and the title track from their first album in almost a decade. Iconic bandleader Chrissie Hynde informs the crowd, “You don’t have to be polite, because we don’t plan to be.” The defiant frontwoman commands the stage, showcasing her still-radiant voice in a career-spanning performance featuring fan-favorites including “Back On The Chain Gang,” “My City Was Gone,” “Mystery Achievement,” and “Middle of the Road.” Pretenders’ trademark tough and tender lyrics resonate as they did when the band arrived on the London scene in 1978. Hynde fondly introduces original member Martin Chambers as “the world’s greatest rock drummer,” as he plays the stirring intro of “Message Of Love.” The band caps the powerhouse set with their signature hit “Brass In Pocket,” as Hynde pulls a spellbound fan onstage to join her on the timeless tune. Tune in this weekend for this episode, and, as always, check your local PBS listings for the broadcast time in your area. Go to the episode page for more info, and don’t forget to click over to our Facebook, Twitter and newsletter pages for more ACL info. Join us next week for a brand new episode, featuring a full hour with multi-platinum superstars Zac Brown Band.